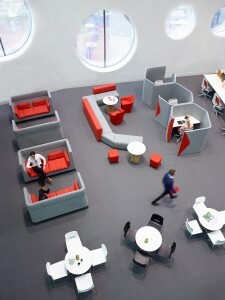 The increase of the ‘knowledge worker’ and the changing influences of technology, connectivity and mobility during the late 20th Century created a trend for the open plan offices many of us work in today. But traditional open plan is no longer fit for purpose and needs to evolve. Our work is now a transitional activity and working hours have fundamentally changed over the last decade. This has created new challenges for organisations. How do they support flexibility, increase productivity, encourage collaboration, make their space work more efficient and make work a destination? Using a simple block planning approach, a series of environments can be provided that are focused on these task areas and the activity being carried out. This gives individuals the freedom to migrate around the office, utilising the furniture setting that is most relevant to the task being undertaken, as well as embracing new technologies. Is the agile workplace just a passing trend? Although it may seem as if everyone from developers to designers conclude that the traditional office will not be seen again, the jury is still out as to which working model will take its place and whether there is a ‘one size fits all’ solution. A number of trends are emerging from a design perspective including flexible working, as well as collaborative spaces and desk sharing. This is encouraging designers and the industry to consider space dynamically, remaining cost-conscious but not cramping the space or leaving desks empty. This leads to a debate between improved efficiency and communication on the one hand, and the control of distraction on the other, and of course we want to meet all the key organisational objectives. This dilemma won’t go away, and as the growing volume of “Millennials” in the workplace still hasn’t diminished the desire for solitary spaces in which to work, the challenge now is to maximise the potential of open-plan spaces to provide more options, and make room for the varying ideas on what constitutes creativity, productivity and encourages collaboration. This isn’t just about having the best looking offices. It’s about flexible spaces that support more dynamic working, that drive performance amongst teams. It helps an organisation to enhance collaboration, engage and retain staff, develop a brand and corporate culture, improve health and welfare, optimise the use of space and encourage staff into the office by creating a genuine destination. We help organisations solve the challenges they face today but also need to be aware of those which will come in the future. The office will always remain relevant but needs to become a destination. Humans are social animals and we thrive on interaction, so the design challenge is changing a generational mindset where the desk that we come to for 40 hours a week reflects our status and position in an organisation, to the acceptance that we can work anywhere in this building and will match the setting to best achieve the task we have been set. As individuals we are questioning everything, we are in a period of change and not only do we question what is work, how we want to work, but also how many employees do I want to work for. Most education has historically been done in a explicit manner, i.e. teach, repeat, test and result, and change is evident to a manner where we now analyse the problem and work to a solution together. This is at the heart of the collaborative drive that is improving business results. The challenge is just as when we order a book from Amazon, we are sacrificing some of our confidential information for convenience. In open plan offices our desire for greater collaboration means we are sacrificing some level of privacy and concentration. Workplace education is essential if the office format is going to evolve at the same rate as its occupants. This requires generations to embrace each other and their alternative approaches to work, as the Millennials’ understanding of technology, and its preference for collaborative working environments, becomes increasingly commonplace. We can recognise the dominant influence of younger generations on workplace design, particularly clearly through the use of the university open zone format in modern offices. As universities and other educational institutions favour open spaces for individual and group work, this will naturally influence the world of work when they move on from higher education into the workplace. The structure of the university open zones, and subsequently the structure of offices, can be broken down into what is called ‘social contract’, ‘participation’, ‘learning is play’ and ‘impact on space’. The ‘social contract’ and ‘participation’ aspects require the understanding of a multigenerational workplace, and planning spaces that complement individual workers and their requirements for social interaction and shared experience. They take their cue from the educational model to influence the office format. ‘Learning is play’ and ‘Impact on Space’ are then the nod to the integration of constantly advancing technologies, as the speed and ease of use mean that technology has now become embedded into our professional and social lives. This will see the rise in ‘playful’ work, bouncing ideas and utilising technological resources to progress plans and create an informal workplace meaning activities can become more focused and fluid. Over the past decade the workplace has seen a dramatic transformation. Offices are now smarter, more flexible and, ultimately, more user-friendly than ever before. In some industries – creative and technology in particular – this has been driven by a desire to make the workplace a more enjoyable place to be. The result has been the advent of what some may see as adult playgrounds. For other businesses, which are perhaps enthused by the evolving workplace, or affected financially by the recession, the introduction of more flexible working has made the efficient use of space a priority at boardroom level. These are just a few of the many issues at play in the metamorphosis of our expectations when it comes to the workplace. Whether at our desks or on the high street, we have grown used to thinking as consumers and, given that we spend most of our week at work, we expect to have the best facilities and latest technologies. We consult with clients from their design brief covering fit out, through to interiors – in partnership with our key partner, The Senator Group. They have developed Settings™ as a method to engage with clients on how best to use their own space. Working with leading organisations to support individual companies’ work styles, it helps create the next generation of workplaces and spaces, designed to support the modern worker: someone whose working day starts and ends at home; someone who uses the offices not necessarily as their dedicated place of work but a place where they can meet, share ideas and collaborate with colleagues, partners and clients. We have presented on this topic at trade shows such as The Facilities Show, ExCel, London and more recently at Office, Olympia, London. Further information can be read on MBM-Omega-The-Agile-Office or contact us to arrange a time to talk.